Today, I’ve got a super simple DIY dog toy for you and it’s thrifty too. Yea! Braided tug toys are pretty durable since there are no seams to rip and no stuffing to come out. These two versions are even washable. 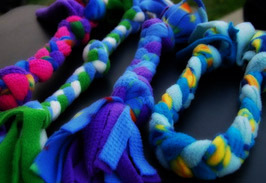 The first braided toy uses fleece. If you’ve got pieces long enough, you can use scraps. Otherwise, the tutorial this tutorial calls for 3 1/4 yards of fleece. Check the remnants table at your fabric store and keep an eye out for sales. If you want a wider braid, try four strands. Just follow these instructions on four strand braids(scroll down). The second braided toy uses pant legs from old pairs of pants. You’ll need two pairs of pants. I think a large binder clip might be handy for when you’re hand sewing each end. An alternate way to finish the ends, might be to tie them off with twine by wrapping the ends a several times and knotting the twine. Easy and cheap!